Calling all Nature Nuts; It’s Time for the Young Naturalists Club Family Nature Nights! The ABMI is excited to announce its participation in Nature Alberta’s Young Naturalists Club Family Nature Nights in Edmonton this summer. The Young Naturalists Club is designed to provide (fun!) educational materials and field trips to youth and families who enjoy learning about nature and the wild outdoors. Registered YNC families receive resources through the mail for organized home activities. They’re also invited to Explorer Day field trips, which include bird watching, pond visits or participation in environmental monitoring projects. These events are organized by Nature Alberta, a volunteer club leader or an expert local naturalist. 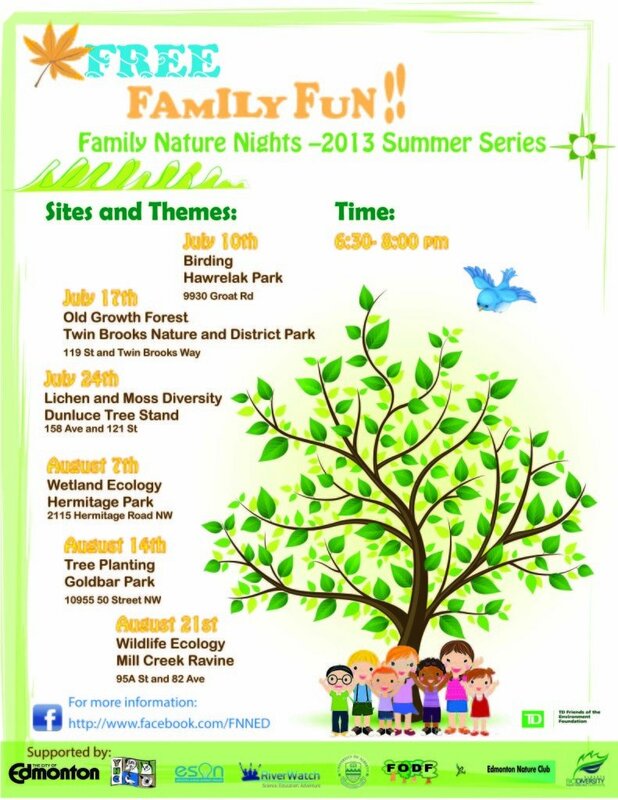 This summer, the YNC will be hosting six Family Nature Nights in Edmonton’s natural areas. Each night, a local expert naturalist will present a talk about their special area of expertise, followed by a guided nature walk, crafts or games. Some topics for this summer include “Old Growth Forest”, “Wildlife ecology”, and “Birding”. The ABMI is especially proud to announce that our very own Amy Nixon will be featured as a local expert at Dunluce Tree Stand on July 24, where she will present on the exciting and mysterious world of moss and lichen diversity. Amy brings lots of fun, excitement and inspiration along with her wherever she goes, so you won’t want to miss it! You can also watch for another ABMI staff, Elyse Williams, as she helps coordinate the evenings. Amy’s exploration of mosses and lichens will highlight species present at the site, as well as special samples provided by the ABMI’s own moss specialist (or, “bryologist”), Richard Caners, and our lichen specialist (or, “lichenologist”) Diane Haughland. The species diversity, habitat requirements and survival mechanisms of mosses and lichens are just a few of the interesting topics the ABMI’s bryologist and lichenologist monitor and study at the Royal Alberta Museum. These free public events take place every Wednesday between July 10 and August 21, from 6:30 to 8:00pm. Don’t miss out on this excellent opportunity to learn about the biodiversity in your own backyard, visit a new Edmonton park, and inspire your children. For more information and a complete schedule, visit the FNN Facebook page or email ync@naturealberta.ca.